Backpacking in the Jotunheim National Park, Norway, 1997 - Day 5: Surtningssua. Previous: Day 4: River crossings and Reindeer. Index Next: Day 6: Sun and Rest. This must have been the best day of the trip - Surtningssua, the 7th highest peak in Norway at 2368m, is a fantastic mountain. I packed up my gear and walked over the pass at the top of the øvre Russglopet valley to Hesltjørna. At this point I had my first proper wash of the trip and stashed all the camping gear to pick up on the way down. From there to the summit of Surtningssua I followed the cairned path. As I gained height the view became better and better, especially to the North over the austre and vestre Memurubreen. The austre and vestre Memurubreen from Surtningssua. Surtningssua itself seemed like a pile of loose rock until I reached the summit where the huge cliffs and the Blåbreen to the East came into view. Sitting on the top next to this huge drop would be enough to give anyone vertigo! The view of Besshø was also revealing as the huge drop that I had sensed in the mist turned out to be a 3km long 1km high cliff face. Perhaps it was a good thing that it had been misty. Besshø (left) and Surtningssua's South summit (right) from Surtningssua. Surtningssua from the South summit. 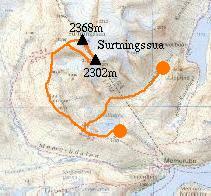 After visiting the subsidary summit to the South I returned by the same route and made camp at the mouth of the Hesltjørna. Total for the day:19km, 1150m.